PRESCOTT, AZ, January 22, 2019 One of the downsides of growing houseplants in Arizona is keeping the environment humid enough to maintain the health of tropical plants, which often need jungle-like conditions to truly thrive. This isn’t a problem for cactus aficionados, as these desert plants appreciate dry air. 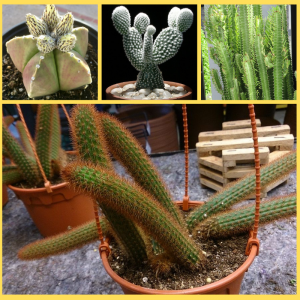 Although the sun is necessary for cactus health, many species can get by on three hours a day, a bright room, or simple lighting can help these specimens thrive in north-facing windows. A happy cactus may even surprise you with vibrant blooms, a bonus for plants that already thrill with architectural shapes and spiny textures. The slow growth and easy-care requirements of these eight popular varieties add Southwest interest to mixed container gardens. Where they really shine is as an elegant standalone specimen. 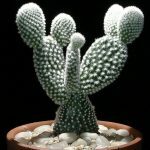 Angel Wings Cactus, Opunta Albispinia, is a member of the prickly pear family but is less spiny with evenly spaced clusters of hairs. This Mexican native grows clusters of pads up to two feet tall. Pale yellow blooms are followed by red, edible fruits on plants that grow under a bright window. 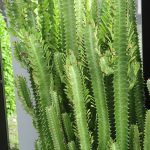 African Milk Tree, Euphorbia trigona, is one of those natural cactus specimens that make every grower feel like an expert. 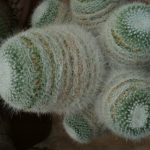 Also known as the cathedral plant, this cactus is unlikely to grow much past four feet indoors. Small green leaves grow between thorns on the ridged stems, and if you grow the rubra variety, the leaves turn a reddish-purple. Like all cactus, plant them in a quality cactus potting soil and water twice a month, and your African milk tree will live for decades. Bishop’s Cap Cactus, Astrophytum ornatum – the simple, spare shape looks striking with decorative gravel mulch and a substantial ceramic pot. Stiff spikes cover deeply ridged spheres, which can attain several feet in height. This cactus can form a white frosty coat that acts as a defense mechanism when exposed to hot sun. Water infrequently and provide plenty of warm sunny conditions if you want to see the yellow blooms develop. Barrel Cactus, Ferocactus genus, lives up to its name of fierce cactus, covered with long, rigid spines that protect its juicy, edible pulp. Barrels live for many decades and eventually reaches a maximum height of 8 to 10 feet in the desert, but never as a houseplant. 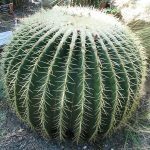 As a houseplant, the barrel cactus craves as much sun as possible, and limited irrigation coupled with a quality cactus potting soil. 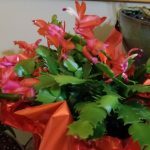 Christmas Cactus, Schlumbergera, is toothless as cactus go, with its smooth leaves and soft, rounded spines. Tubular flowers come in red, pink, orange and white. 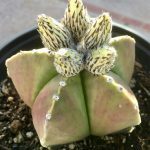 This cactus species is a departure from ordinary cactus care, as the plant hails from Brazilian rain forests, where they live nestled in tree branches. Give your cactus filtered light and treat it like other tropical houseplants. Expose your plant to temperatures between 50-60 F as winter approaches and witness an impressive rebloom. Rat Tail Cactus, Aporocactus flagelliformis, is better if your sunniest window only has room to accommodate a hanging basket. This plant is indigenous to Mexico, where the natives value its vibrant magenta blooms in traditional medicines for heart problems. Thick stems can trail down three feet, and very easy to grow. Saguaro Cactus is for anyone who visits and Arizona desert and can’t forget the sight. They don’t grow at high altitude but can quickly fill a large indoor room. These majestic cacti live for centuries and take up to 40 years for a flower to appear. The slow growth rate makes it possible to grow one for many years as an indoor houseplant. Give your saguaro as much light as possible and water sparingly; about once a month should do it. Old Lady Cactus, Mammillaria hahniana, is as full of personality as its elderly name suggests. She forms small colonies of ten-inch tall spheres, which feature white hairs and spines. Healthy plants may feature a halo of pink blooms like a crown atop her head. 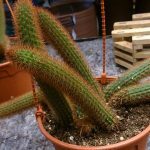 Plant this cactus in a quality cactus potting soil, and water every other week; monthly in winter.